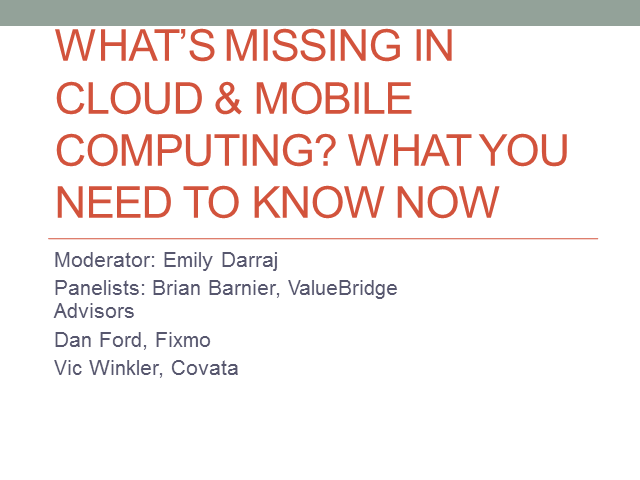 Cloud and mobile computing are in the news. Is this duo hot, hype or both? What’s really new and what’s really old? What risks are of most concern? How broad is the range of risks? What really are the root causes of risks in the mobile and cloud environments? How can you more effectively watch for warning signs of trouble? How can you best prioritize your risk responses to strengthen capabilities in general and prepare for the “bad thing?”? How can responses be most efficiently designed? How can you help business and IT leaders balance business risk and reward? More, how can you do this most easily? With a mountain of good guidance available, to what do you turn and how do the documents interrelate? Join our expert roundtable to help you separate fact from fiction and develop an action plan that packs the most business benefit. Our lively experts bring years of experience in a wide range of business and IT disciplines. Bring your toughest questions to put them to the test and speed progress on your projects.